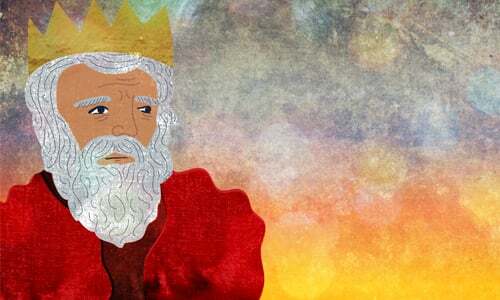 In the meantime, G‑d arranged for Samuel to meet the man who was to become the first king of Israel. In the small but valiant tribe of Benjamin there lived a man named Kish. He had a son Saul, a young man of tall and majestic stature, towering more than a head above the rest of his townsmen. It so happened that some donkeys belonging to Kish had wandered astray and were lost, and that he bade Saul go with one of his servants to recover the animals. The two set out; and passing through Mount Ephraim and the surrounding country, they arrived, after a three days' search, in the land of Zuph. Saul searched far and wide and inquired everywhere about the lost donkeys. At length he was ready to give up his fruitless quest, which had taken him far from his home to the outskirts of the city of Ramah. But the faithful servant suggested to Saul that a seer, a man of G‑d, dwelt in the neighborhood and that perhaps he would be able to tell them which path they ought to take. On the day before Saul came to Ramah, G‑d had told Samuel to expect the future king on the following day. Samuel, therefore, made preparations for welcoming him and invited a few guests to eat with him that day. As Saul entered the city, he approached a man to ask where the seer lived. Unknowingly, he had chanced upon Samuel himself. The latter immediately recognized Saul, the man for whom he was waiting. Samuel invited Saul to the feast, telling him he need not worry about the donkeys, since they had been found. At the same time, Samuel hinted to Saul what there was in store for him. Saul, a modest person, countered that since he was of the youngest tribe of Israel —Benjamin, he could not expect such an honor. Samuel took Saul home and introduced him to the other guests, and they feasted together. On the following morning, Samuel called Saul early and accompanied him and his attendant to the gate of the city. There he bade the servant pass on and wait for his master; and then turning to Saul, he said to him. "Stand thou still awhile, that I may let thee hear the word of G‑d." He took a vial of oil, poured it upon Saul's head, and kissed him saying, "Behold, the L-rd has anointed thee to be chief over His inheritance!" Then he foretold minutely what would happen to Saul on his return; how the onkeys had been found, and how his father Kish was sorrowing for his absence. He, moreover, informed him that on his way home he would meet in the plain of Tabor, three men going to the holy place at Beth-El with their offerings in their hands, and that they would give him two of the loaves they were carrying; that further on his way, near Gibeath-Elohim (the Hill of G‑d), where a garrison of Philistines was stationed, he would encounter a company of prophets, descending from the hill with a psalter, a taboret, a pipe and a harp, all prophesying: then would Saul be endowed with the spirit of G‑d, and he also would prophesy. The moment Saul turned to leave Samuel, he felt inspired and elated, as though he had become transformed into a different man. Soon, two men coming from the direction of Rachel's grave, informed Saul of the finding of the donkeys, as Samuel had predicted. Further on, he encountered three men bearing presents to Beth-el, one of whom gave Saul two of the three loaves of bread he was carrying. Later, near Gibeath Elohim, he came upon a party of prophets. Suddenly the spirit of G‑d rested on Saul, and he joined the prophets. Those who recognized Saul were surprised to see him among the prophets. "Fancy Saul among the prophets!" they exclaimed. And this saying passed into a proverb. However, Saul guarded his secret and related to no one that the prophet Samuel had anointed him as King of Israel. Meanwhile Samuel called the people together at Mizpah; they came from all the tribes; and having once more solemnly pointed out the importance of the step they had decided upon, he proceeded to select their future ruler by lot. The lot fell first upon the tribe of Benjamin, and then next upon the household of Kish, and lastly upon his son Saul. But Saul was not present at the casting of the lots; after a search he was at last found hiding in the fields, and he was brought before the assembled tribes. His majestic and comely person struck all beholders. A great shout rose up into the air, and for the first time the cry was heard in Israel, "Long live the king!" Samuel reviewed the duties of a king in Israel. The Torah must always be with the king wherever he goes. He must never feel haughty and superior to his brothers. He must not seek pleasure and must study the Torah continually, etc. Saul was in no hurry to impose his reign upon the people. He bided his time for the right occasion to assume the powers delegated to him. In the meantime, he returned to his home in Gibeah, with a number of followers. An incident soon occurred which proved Saul to be a mighty king. Nachash, King of the Ammonites, with a mighty army had besieged the city of Jabesh-Gilead, in the territory of Benjamin. When the inhabitants of the city realized that they could not expect any help from outside, they made overtures for peace. But Nachash would accept surrender only on one condition; namely, that every person submit to having one of his eyes put out. Nachash wanted to test the strength of the new Jewish Kingdom, and to determine whether it would rally to the aid of a besieged city or accept defeat. Hearing this barbaric ultimatum, the besieged Jews asked for seven days in which to decide upon their answer. Hastily they dispatched messengers to their brethren in Gibeah to relate of the calamity that awaited the beleaguered city of Jabesh-Gilead. Just at that time Saul was entering the city, and he heard the dreadful news. The spirit of G‑d suddenly came over Saul as he listened to the words of the messengers. He was filled with anger at the enemy who dared to threaten his brethren with such a crushing defeat. Cutting two oxen to pieces, Saul sent them throughout Israel, saying, "Whoever will not go out after Saul and Samuel, will have his herds treated thus." The people responded nobly; they rose as one man and assembled at Bezek an army of three hundred and thirty thousand men. The messengers from Jabesh-Gilead were sent home with the assurance that help would come the next day. In three companies Saul moved against the enemy. That night he struck the Ammonites with such suddenness that they fled in confusion. This glorious victory secured the fame and authority of Saul. So great was the enthusiasm which it kindled among the people, that, eager to show their devotion, they turned to Samuel with the request that they be permitted to mete out the death penalty to anyone who had not shown allegiance to Saul. On this occasion, Saul displayed his greatness of character. "No one shall be put to death," he proclaimed, "for has not G‑d wrought deliverance in Israel this day?" He ordered feasts of public rejoicing to be held and sacrifices to be offered to G‑d at Gilgal. All the people assembled round their king Saul and their prophet Samuel. Isn't Abimelech the first king of Israel in the bible? Re: The prophecy of Jacob was that the scepter will never be removed from Judah, meaning that once a King from the tribe of Judah would be anointed the Kingdom will remain in the tribe of Judah forever. Until that happened, however, there could have been a King from another tribe.